Repertoire packets for all three choirs will be available to order through JWPepper. 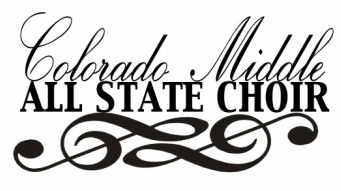 Go to "State & Festival Lists" at the bottom of their home page to access the lists for Colorado Middle School All State. After ordering music, students should learn their part with the help of official rehearsal tracks. Canto Del Agua: TTB - David Hill - Alliance Music Publications, Inc.